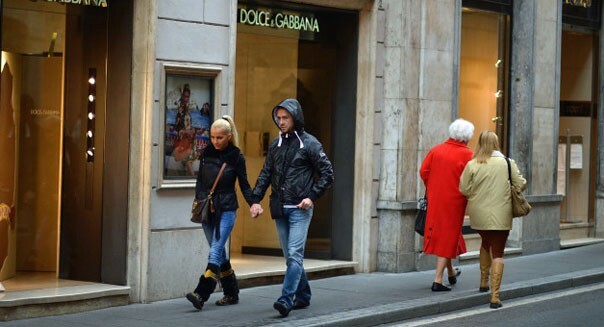 Jeff J Mitchell/Getty Images Shoppers walk down Via Condotti on Monday in Rome. A European Commission report issued Wednesday shows Europeans' confidence in the economy worsened in March. BRUSSELS -- Confidence in the eurozone's economy worsened in March, falling after four straight months of gains and suggesting a hard route out of recession, European Commission data showed on Wednesday. Economic sentiment in the 17 countries using the euro decreased by a worse-than-expected 1.1 points to 90. Economists polled by Reuters had expected a decline to 90.4. "The crisis atmosphere is back, uncertainty is back, and it also shows that the eurozone is still a long way out of the recession," said Carsten Brzeski, an economist at ING Groep NV (ING). "With these numbers we're heading toward another contraction in the first quarter," he said. Analysts said the survey may be the first to show some of the impact of the Cypriot crisis on business confidence across the eurozone, although the study makes no specific reference to the fallout from the chaotic bailout that began following a meeting of eurozone finance ministers on March 15-16. Italy's inconclusive election last month, which has failed to yield a government, also weighed on sentiment, economists said. "There have been new uncertainties due to the situation in Italy, now Cyprus probably doesn't help," said JPMorgan Chase's (JPM) Greg Fuzesi, noting that the situation is preventing the data from improving quickly. The decline in confidence put a halt to a sentiment recovery that had begun in November last year, undermined by a much more negative outlook from manufacturers, who had been helping Europe's economy through exports. The eurozone's measure of the business cycle also reflected this, posting a fall in March of 0.14 points to -0.86. Factories worsened their evaluation of their past performance and export order books, with the European Commission saying they had "declined markedly". Services also broke a trend of rising confidence since October, with managers of everything from health clinics to theaters lowering their expectations for consumer demand. One bright spot in the Commission's data was the relatively stable consumer confidence, which increased 0.1 points, due to higher expectations by consumers of their possibilities for employment.